Posted on Monday, June 2nd, 2014 by CommunityEngagement. How often do you get to return to the site of your greatest achievement and top it? In the late 1980s, Angela Polk-Jones scorched her way through the UNCG Women’s Basketball record books. Named First Team All American, she led the Spartans to the Division III Final Four. Today, she’s doing something bigger. 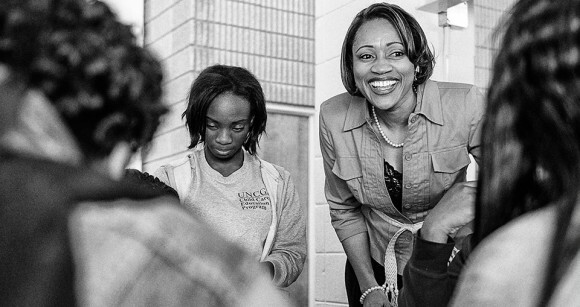 As founding principal of the Middle College at UNCG, she is preparing for the first senior class in August – and a full complement of four grades with 200 students. The concession stand that fed fans at halftime when she played ball now prepares lunch for her students. On the second-floor landing of the HHP Building where she studied before practice, her students collaborate and read. The school focuses on health and medical careers as well as those in youth development. The young people may become nurses, pharmacists, doctors, nutritionists. “Three-fourths will go in that direction. They are getting exposure,” she says. “Our vision for the students is to be college, career and life-ready,” she explains. The incoming students are typically at risk for not getting the level of instruction they need to reach their full potential or becoming disengaged because of other factors. At this middle college, part of the Guilford County Schools system, they have the opportunity to earn up to two years of college credits while meeting their high school graduation requirements. The middle college began as a dream of kinesiology professor Dr. Tom Martinek, and became a reality with the work and support of Chancellor Linda P. Brady and many others. Polk-Jones finds herself on the same campus with those who taught her as an undergraduate, such as Dr. Sam Miller. “Dr. Miller made you really, really think and dig deep.” And with professors she had as a school administration master’s student, like Dr. Rick Reitzug and Dr. C.P. Gause. “I like professors who take time to have dialogue – not just lecture,” she explains. No one at UNCG had a bigger impact on her than Coach Lynne Agee. “She was like a second mom for us. She made it really feel like we were a family.” Polk-Jones would later return and be a Spartan assistant under Agee for several years. In turn, she is helping expose the young students in the middle college to things they’ve never experienced. Being on a university campus. Internships. Learning about health careers – oftentimes from the health providers themselves. Her office adjoins Fleming Gym. She tries to catch a game when she can. Her No. 34 jersey hangs in the rafters – the first ever retired at UNCG in any sport, women’s or men’s. As the 2011 class of ninth-graders prepare for their senior year, see a video of their very first day at the Middle College at UNCG.